The Motley Fool Canada » Bank Stocks » Can Investing Lead to Growth for This Bank? Can Investing Lead to Growth for This Bank? Surprisingly, Bank of Nova Scotia (TSX:BNS)(NYSE:BNS), or Scotiabank, posted the highest recent net margin of 22% among the Big Six Canadian banks. It also offers a yield that’s about 7% above the peer average of about 4.26%. So, it should be worthwhile for conservative investors to consider the stock, especially for investors with a focus on income. Although Scotiabank is known as Canada’s most international bank, it still generates the core of its earnings (about 55%) in Canada, which more than covers for its dividend. It is a top 10 bank in the Americas — the seventh-largest by market cap and eighth-largest by assets. Scotiabank generates about 90% of its earnings in the Americas, including 21% in Pacific Alliance countries and 7% in the United States. BNS data by YCharts. 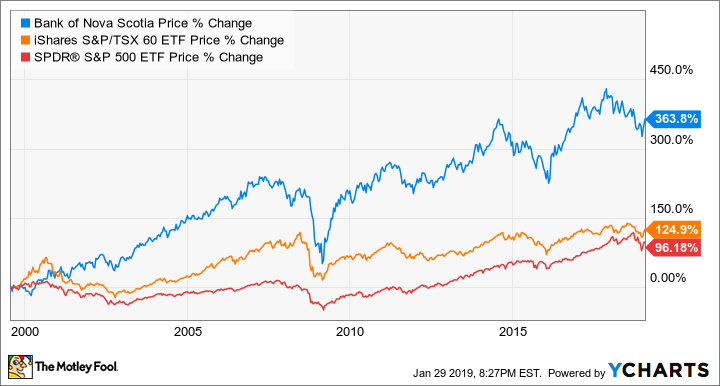 The long-term price action of Scotiabank, the Canadian stock market, and the U.S. stock market. Last year, Scotiabank made a number of key acquisitions. First, the acquisition of Jarislowsky Fraser (JF) added $40 billion in assets under management and a customer base of more than 500 institutional and high-net-worth clients. Second, the acquisition of MD Financial Management (MD) added $49 billion of assets under management and administration and 110,000 customers (i.e., physicians and their families). With the JF and MD acquisitions, Scotiabank has become the third-largest active asset manager in Canada. Scotiabank management has its eyes set on the wealth management segment to contribute about 15% of its earnings over the next five years. And the JF and MD acquisitions will help it achieve that. Scotiabank’s international focus has been in the Pacific Alliance region: Chile, Colombia, Mexico, and Peru. It has increased its earnings by more than 70% from this region over the last four years. Those countries have a relatively young population and low levels of banking penetration. So, the region should contribute meaningfully to Scotiabank’s medium- to long-term growth. Last year, Scotiabank doubled its market share in Chile and became the third-largest private bank in the country when it acquired BBVA Chile, which added 500,000 customers and $29 billion in assets to its portfolio. It also expanded its Colombian operations by acquiring Citibank’s consumer and small and medium enterprise operations in Colombia. Scotiabank has been making strategic acquisitions and investing for future growth. Despite the fact that the stock has popped 8% in the last month, the quality bank is still trading at about a 14% discount from its normal multiple. A year from now, the stock could trade as high as $90 for 21% upside if things go smoothly. No matter if the stock goes up or down, shareholders can be sure to collect a yield of roughly 4.6% that’s supported by a sustainable payout ratio and a growing dividend. Fool contributor Kay Ng owns shares of Bank of Nova Scotia. Bank of Nova Scotia is a recommendation of Stock Advisor Canada.